As always, last week's Frugal Friday was filled with frugal inspiration. My Backyard Eden shared a super easy way to create your own faux frosted glass...I'm thinking I'm gonna need to try this one! Notions on Nesting shared a Martha-inspired idea that I'm going to have to adopt at my house...color coded towel tags. So cute! Red Door Home shared a redo of a fabulous metal topped coffee table. I just love metal topped tables!!! Another great furniture makeover was shared by House of Giggles. I just love the stripes on this demilune table! So fresh and beachy! If you haven't had a chance to check out all the Frugal OCD (obsessively consumed with decorating) goodness from last week's Frugal Friday, you're missing out! Check it out here. Oh, everything is so pretty...including your new banner and button! I am so behind in my blog rounds...I really need to catch up on all of the sweet things to see!!! What a great group of projects. Thanks for including mine. Your new blog design is so pretty. Love the new blog design! Very pretty. And thanks for posting the linky love. I always enjoy the great thrifty ideas that everyone contributes. Gorgeous choices. Each one a real beauty! Wendy! Thanks so much for featuring my little stripy table!! I love your linky parties! EVerything you featured is beautiful but I must say that the frosted glass cabinet was an excellent idea. I love that ! Beautiful! I really love that coffee table! I love the updated look! So cute and fresh! Wow! Thank you for featuring my color coded towels on your blog. What an honor! I love your new look. I love the color-coded white towels idea and missed this from last Friday. Thanks for sharing your favs! 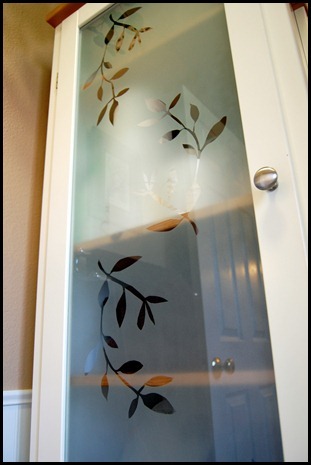 Thanks so much for featuring my frosted glass! Your new blog design is lovely!